Hi to everyone who kares4kerri! Kerri has made it through Day 4 of the planned 5 days of high dose boosters. The newly implanted port is working well and she is glad to be rid of any arm IV’s and having to be stuck looking for veins. The first 2 days went so well that on Days 3 and 4 Dr. Cantu has been able to increase her dosage for even better results. The last 2 days have been a little bit rougher for her to handle but this is totally expected. She is now walking very short distances on a regular basis and her pain levels and sensitivity to touch are definitely coming down! Last night Kerri was able to travel in her wheelchair with her IV pole that Dr. Cantu says looks like a Christmas tree because it is so full, to visit a very brave, intelligent and sweet young lady named Estefy. The two girls already knew of each other through the amazing Jessica. A nurse stopped down earlier in the week to say there was a new amiga (friend) down the hall for Kerri to meet. Kerri and I had so much fun getting to know to Estefy and her Mom. We hope to get more chances to visit with them this week. Estefy and her family have even started an RSD Foundation here in Mexico to raise awareness about RSD and funding for research. Her family lives right here in Monterrey. Last night Kerri felt well enough to ask me to read her all of your wonderful messages to her on the karing4kerri blog. She enjoyed them so very much – thank you all! Mark has been keeping quite busy traveling back and forth to the Safi hotel each day. Thanks to the help of our friend Sarah, his travels have been safe, and as Dr. Cantu says “on dot!” With some careful planning and additional help from Sarah, Mark was even able to get our laundry done today. I found him a Father’s Day card this year that says he’s a Superhero husband. That title really fits all the time, but “Wow” does it apply this year! Jeff (Kerri’s “novio”) met my Dad in Princeton yesterday to pick up Erin and take her to her Bon Voyage picnic in Pennsylvania to get ready for the People to People ambassador trip she will get to take in July. Jeff, although he is such a wonderful part of our family already, really helped Erin to feel special by being her family for the event. I very quickly got some great pictures from Erin of our flowers in the front yard and some cute pics of Hershey and Boomer. I think Erin is enjoying taking care of the home front for a few days but will also be happy to travel back to spend some more time with Nana, Poppop and Uncle Chris. She has had some great times this week with them and also got to be a part of the fun Father’s Day miniature golf tradition with Uncle Tom and his girls. Kerri got the chance to talk to Uncle Chris on the phone last night and as always, he managed to cheer her up immensely and make her laugh like only Uncle Chris can do! So from the beautiful, healing city of Monterrey we say Buenos Noches! I’m writing tonight through some Mom and Dad tears of joy. Kerri’s recovery from the port surgery is going really well and she is already showing some signs of improvement tonight after the 2nd day of high dose ketamine boosters. Her side effects so far are much less than ever before and she was able to really enjoy eating a meal today for the first time since February, when RSD again started affecting her ability to eat without pain. Just now she was able to walk about 20 feet just barely holding onto the IV pole with her left leg moving instead of dragging and causing her to trip. This is a first since April! Dr. Cantu not only spent 2 hours by her bedside today to administer the booster, but also came back this evening to sit down and talk with Kerri about making a plan together for the remainder of her hospital stay and to have her let him know how everything is going. We are so very, very blessed for Kerri to have the honor of being one of his patients. We want to wish Nana and Poppop (Kathy’s parents) a very Happy Anniversary today. As anyone knows who ever been lucky enough to meet them, these are two of the most amazing, considerate, wonderful people in the whole wide world. They are making Erin feel so special and loved this week and reassuring her that everything is going to work out fine. We also want to wish a belated happy birthday to our terrific neice, Patricia. Here goes for another Monterrey coincidence. Today during Kerri’s boosters, Dr. Cantu was admiring the picture we have hanging up of Kerri, Erin, Teresa and Patricia. We were telling him about the work Patricia does with the Seeing Eye Program helping to deliver puppies who will become guide dogs. 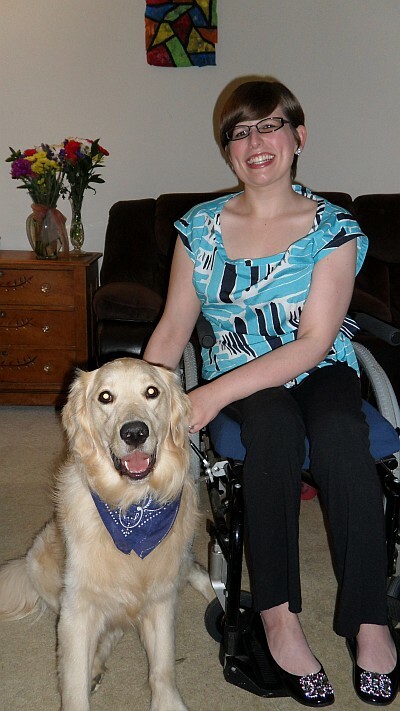 A few hours later we read on the blog of another amazing RSD patient, Fern, that she will soon be getting a service dog to help her be able to enjoy life more and become more independent. Fern lives in Canada, so today we got a chance to converse about service dogs in Mexico, the United States, and Canada. And Happy Birthday also to Kerri’s good friend, Alexis. She is one of the first people Kerri ever met when we first moved to Pennsylvania back in 2001, and our whole family has been so lucky to enjoy her company all of these years. And two more birthday wishes to Megan and Russell! Megan is Kathy’s goddaughter/cousin is not only a much loved family member but also a one of a kind, caring friend to both of our girls. Kathy was the luckiest student ever to start college meeting her roommate, Iris, Russell’s Mom was quickly to become her best friend for life. Iris, we’ve come a long way since then! And now for a bit more news to entertain you. Kerri woke up from her booster yesterday speaking with a Spanish accent and using all the Spanish words she has learned! The accent disappeared as she woke up more but it sure was delightful! She is very happy that the lady in the hospital cafeteria has once again sent up a container of the pimiento robusto (spicy pepper) that Kerri loves when here in the hospital. It turns out Kerri and Dr. Cantu are both fans of pepper! The woman in the restaurant also made my (Kathy’s) day by telling me I’m making good progress with figuring out the money here in Mexico. Thank you so much for all of your prayers. 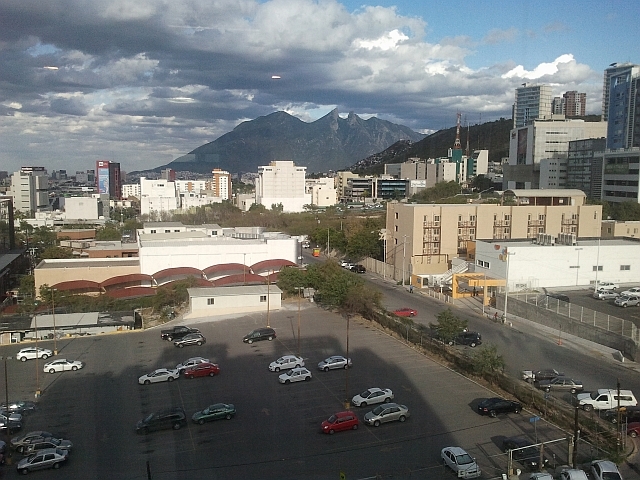 God is definitely watching over Kerri here in the beautiful city of Monterrey. Thanks also for your comments on the blog – we all love to read them! 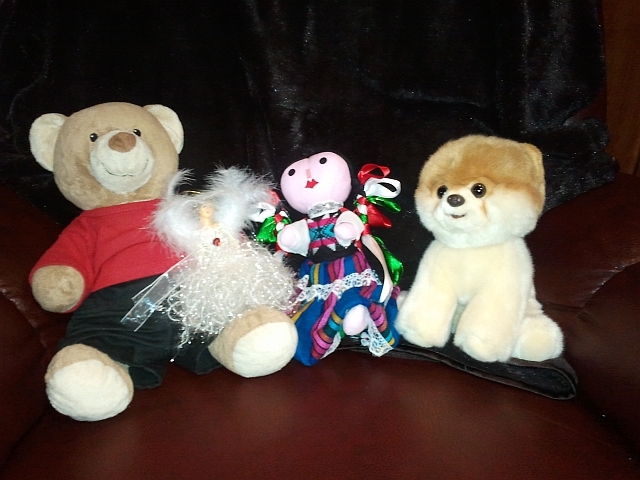 These are Kerri’s companions watching over her in the hospital: a beautiful handmade Mexican doll from Kerri’s RSD soulmate, Jessica, a very special angel from Jeff’s neice, Gabby, Boo (the cutest dog in the world) from Kerri’s good friend, Yaniv, and of course Jeff the bear who helps get Kerri through when the love of her life, Jeff can’t be right there. We have a very special story to share with all of you. On Christmas morning, we were surprised to find a jar of coins on the front step with a book and note attached. The book is called “Christmas Jars,” and the note read, “Kerri, God bless you this Christmas time and always.” As you can guess, we were all very surprised, and this random act of kindness moved us to tears. We would like to take this opportunity to thank Kerri’s anonymous Christmas angel for their incredible generosity. Words cannot express how grateful we are for your compassion and consideration. 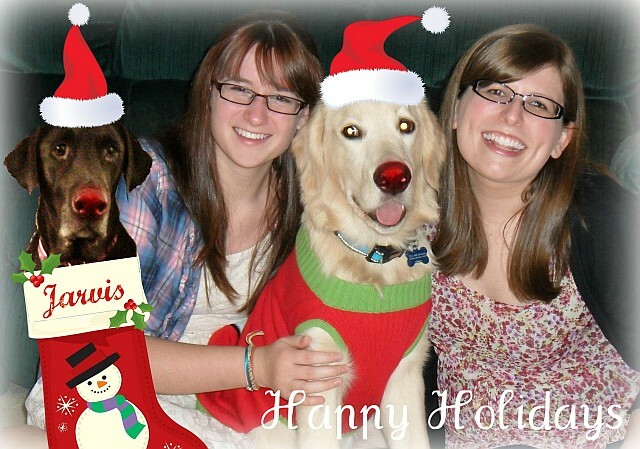 You made our Christmas very special! As we ring in the new year, we would like to take a moment to thank all of you for your generous support over the years. Kerri’s progress would not have been possible without you! We will continue to update over the next few weeks as Kerri makes her decision on which treatment path to follow. May you all have a happy, healthy, and joyous 2012!